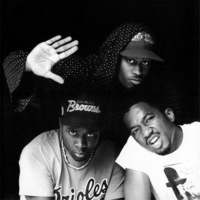 A Tribe Called Quest is an American hip hop group, formed in 1985. It was composed of rapper/producer Q-Tip (Kamaal Ibn John Fareed, formerly Jonathan Davis), rapper Phife Dawg (Malik Taylor), and DJ/producer Ali Shaheed Muhammad. A fourth member, rapper Jarobi White, left the group after their first album but appears to have rejoined the group since 2006. Along with De La Soul, the group was a central part of the Native Tongues Posse, and enjoyed the most commercial success out of all the groups to emerge from that collective. Their innovative fusing of hip hop and jazz has had a lasting impact on hip hop music, helping to expand the art of hip hop production. Many of their songs, such as "Bonita Applebum", "Can I Kick It? ", "I Left My Wallet in El Segundo", "Scenario", "Check the Rhime", "Jazz (We've Got)", "Award Tour" and "Electric Relaxation" are regarded as classics. They released five albums in eight years (the first one being in 1990 and the last one in 1998), the first three LPs were highly acclaimed, but the group disbanded in 1998. In 2006, the group reunited and toured the U.S., and planned to release an album after some works in the studio. The group is regarded as iconic pioneers of alternative hip hop music, having helped to pave the way for innovative hip hop artists.Allmusic calls them "the most intelligent, artistic rap group during the 1990s". In 2005, A Tribe Called Quest received a Special Achievement Award at the Billboard R&B Hip-Hop Awards in Atlanta. In 2007, the group was formally honored at the 4th VH1 Hip Hop Honors.